The story of the Adamson House begins with love. Rhoda Agatha Rindge was the headstrong young heiress of the Rancho Topanga Malibu Sequit, the practically priceless 24,000-acre estate that her family had owned since the early 1890s. Merritt “Smoke” Adamson was a clever lawyer and former USC rugby star who dreamed of being a cowboy. When Rhoda’s mother, the indomitable May Knight Rindge, hired Merritt as the ranch foreman of the sprawling Malibu, she had no idea that she would be setting in motion a series of events that would quickly slip out of her control. May Rindge liked to be in control. Her beloved husband, Frederick Hastings Rindge, had bought secluded Malibu, with its 22-odd miles of breathtaking oceanfront, in the hopes of making it a nature preserve and “American Riviera.” It became the family’s private paradise, and soon included successful cattle ranching and grain-raising operations. After Frederick’s premature death in 1905, the fierce and unfriendly May, who had grown up on a hardscrabble Midwestern farm, fought to preserve Malibu’s pristine beauty and private status, battling squatters, real estate developers, railroad companies, and even the government. This independent spirit came in handy when Merritt was injured on the ranch. Rhoda nursed him back to health, and against May’s strong objections, a romance and true partnership blossomed. When the two married in 1915, at the Mission Inn in Riverside, her mother did not attend the ceremony. However, May eventually came to accept Merritt as part of the family, perhaps because he loved “Western” ranch life as much as his wife. In 1916, the couple, perturbed by the lack of quality milk for their newborn daughter, Rhoda May, decided to start a dairy in Tarzana, just across the mountains. They named it Adohr Farms (Rhoda spelled backwards) and began to raise a prizewinning Guernsey herd. Adohr would eventually become one of the biggest dairies in America, and a “cash cow” that would sustain the family for many decades to come. Rhoda Agatha Rindge was the headstrong young heiress of the Rancho Topanga Malibu Sequit. Merritt “Smoke” Adamson was a clever lawyer and former USC rugby star who dreamed of being a cowboy. In 1923, the Adamsons, known to friends as “the most devoted of couples,” began to plan for a spectacular beach house on the sea. The site they chose, known as Vaquero Hill (for a cowboy shack that had once stood there), was part of 13 acres of Malibu that May had given them as a gift. The hill, just east of the lovely Malibu Lagoon, had an ancient history, having served for centuries as a trash dump for the native Chumash people. The Adamsons put together an all-star team to construct their home. Architect Stiles O. Clements of Morgan, Walls & Clements was hired to design the house. Clements was known primarily for his commercial and public buildings, including the Mayan Theater, the Beverly Hills High pool building, and the Pellissier Building and attached Wiltern Theatre. John Holtzclaw was the interior designer, and all the furniture was either made by him or the firm of Barker Brothers, which also made bespoke furniture for William Randolph Hearst at his opulent San Simeon estate. Artists Ejnar Hansen and Peter Nielsen were brought in to decorate the home’s extensive woodwork. Although labeled a “beach cottage” on the original blueprints, by the time the home was finished in 1930, it was much more than a simple cottage. 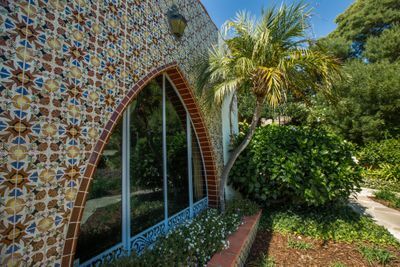 The 10-room “Moorish-Spanish-Colonial Revival” concrete structure, which some have called an “Andalusian farmhouse,” was filled with details specific to the owners’ personalities. Rhoda’s love of castles was evident in the slit-like windows and in the concrete stair wall, which was cast to look like stone from an ancient fortress. Merritt’s love of boating led to details like a porthole window in the master bedroom and distressed wooden floors on the second floor that mimicked the planks of a ship. Stucco walls were painted to look like rough water and reflected sand. Every family member’s bed featured a family crest, while daughters Rhoda May and Sylvia’s faces were painted into the wooden beams in the living room. Commerce was also celebrated, with designs featuring the Adohr Farms’ own cattle brand painted throughout the house. As a primarily commercial architect, Clements skillfully blended the traditional with new modern conveniences. The family was “spiritually protected” by a stylized broken cobblestone yard leading up to the front door. In the dining room, a button under the head of the table allowed Rhoda to conveniently call the servants. In a second floor nook, a beautiful oil painting could be converted into a small table. The house’s isolation, far from the Los Angeles electrical grid, meant that a generator had to be placed under the bathhouse. Almost every bedroom opened onto a balcony, and Andalusian “donkey windows” offered magnificent views of the sea. In the master bedroom, a clear glass window allowed Merritt to keep a close eye on the family’s property. Legend has it that May agreed to give her daughter a discount on the tiles if they allowed her to use the home as a showplace. Tile is the first of a great many uses to which these clays will be put, while the rancho’s development will call for the utilization of all its natural wealth. The pottery … is planned and constructed so that throughout its entire operation there is no lost motion from the time the raw materials enter one end of the 500 foot building until the tiles pass through the three great kilns into the shipping room. Legend has it that May agreed to give her daughter a discount on the tiles if they allowed her to use the home as a showplace. While it is not known if this actually occurred, there is no doubt the home was Malibu Potteries’ masterpiece. 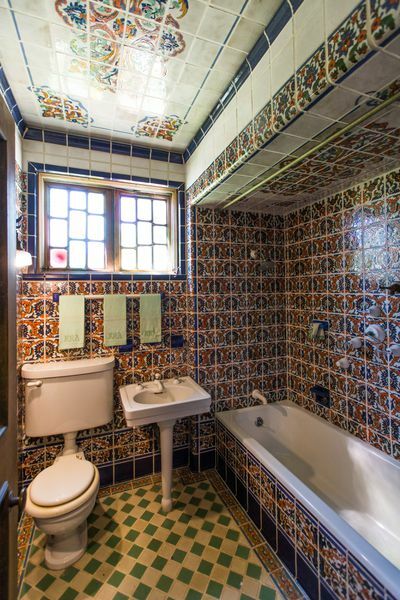 Beautiful custom tiles, featuring trees and flowers, cover the bathrooms, kitchen, and floors. Native American, Andalusian, Art Deco and nautical themes are also represented. Designed by William Handley, a magnificent 60-foot tile Persian rug leads from the foyer into the living room. Outside, tiles cover the benches, fountains, and a saltwater pool. They even decorate an outdoor bath, which was used to wash the family’s numerous dogs. The Adamsons moved into their second home in 1930 (until 1936, their primary residence was in Hancock Park). Although a U.S. Supreme Court case in 1925 had forced May to allow some development and government infrastructure on the property, it was still remarkably secluded. The family’s nearest neighbors were Malibu Potteries and “the Colony,” a cluster of around 100 small, temporary beach shacks that movie stars like Bing Crosby and Constance Bennett leased from May, in her first begrudging stab at development. A truckload of lumber arrived at a point in front of the palatial estate of Mrs. Rhoda Rindge Adamson, one of the Rindge heirs, about three miles north of Las Flores Canyon Bridge … meanwhile a score of Rindge employees had mobilized themselves into a defending patrol, concentrating their reconnaissance in the vicinity of the Adamson property. [N]otice of settlement claims of unappropriated land under the act of May 14, 1880: To whom it may concern, Notice is hereby given by the undersigned Raymond G. La None … that he claims prior rights to entry under the act of May 14, 1880, of the following described lands, to wit: All unapportioned, unsurveyed lands both north and south of the State highway lying between the southerly boundary of the Rancho Topanga Malibu Sequit and the mean high tide line of the Pacific Ocean in Los Angeles county. A magnificent 60-foot tile Persian rug leads from the foyer into the living room. Outside, tiles cover the benches, fountains, and a saltwater pool. They even decorate an outdoor bath, which was used to wash the family’s numerous dogs. The Adamson employees approached the claim jumpers and a war of words began. The standoff was on the verge of violence when local deputies arrived at 3 a.m., armed with tear gas bombs and warrants. The deputies arrested the first 12 squatters they encountered, then convinced the rest of the squatters to return home, explaining to them that their assumption about the ownership of the beachfront property had been incorrect. The land belonged to May Rindge. 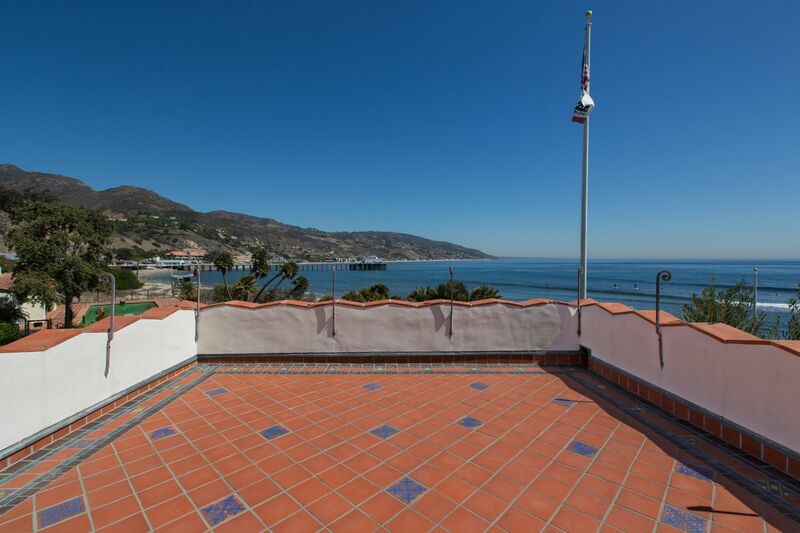 The Adamsons continued to live in Malibu, but May was eventually forced to sell more and more of her land. The revenues from Adohr Farms, which expanded to a second location in Camarillo, kept the family afloat. When May died in 1941, decimated by decades of expensive court battles, she had only $750 in her bank account. Further changes came that year when the U.S. entered World War II. The Adamsons’ house, isolated on an elevated knoll on the shore, was the perfect target for enemy ships. Blackout curtains—some still evident today—were installed in the house, and the Coast Guard took over the bathhouse and grounds of the property. To do his part, Merritt would ride up and down the beaches, making sure the wild folks in “the Colony” were obeying blackout orders.